Antonina (Sokolowska) Chrzanowski, 96, widow of Zygmunt Chrzanowski, of New Britain, passed away peacefully on Saturday, April 14, 2018, surrounded by her family. She was born in Poland and immigrated to the States in 1976, settling first in Worcester, Mass., and then later with her family to New Britain. She was a devout parishioner of Sacred Heart Church and will be remembered for her love and devotion to her family, cooking delicious meals and tending to her beautiful gardens. She will be dearly missed by her children, Irene Supinski, Witold Chrzanowski and his wife Elizabeth, Mieczyslaw Chrzanowski and Jaroslaw Chrzanowski and his companion, Valerie. 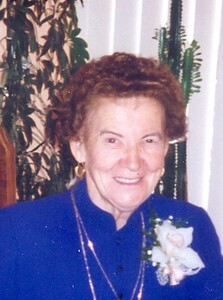 “Babci,” will also be dearly missed by her precious 11 grandchildren, 14 great-grandchildren, and many nieces and nephews. Antonina was also predeceased by her daughter, Janina, a son, Eugeniusz, grandson, Steven, two brothers and a sister. A time of visitation will be TODAY, Tuesday, April 17, 2018, from 4-7 p.m. at New Britain Memorial Donald D. Sagarino Funeral Home, 444 Farmington Ave., New Britain. Funeral services will begin Wednesday, April 18, 2018, 8:30 a.m. at the funeral home, followed by her funeral liturgy at 9:30 a.m. in Sacred Heart Church. Burial will follow in Sacred Heart Cemetery. For directions or online messages, please visit www.newbritainsagarino.com . Posted in New Britain Herald, on Tuesday, 17 April 2018 21:40. Updated: Tuesday, 17 April 2018 21:42.